Maggie is starting her first day of high school. It's also her first day of public school since she spent her childhood home-schooled by her mother along with her three older brothers. Making friends, isn't really something Maggie had to do, so when she falls in with a brother and sister she couldn't be happier. Her oldest brother isn't as excited though, there seems to be some bad past between them. On top of all this Maggie is being followed around by a ghost. She has to figure out her life while trying to help the ghost so that she can move on. Sometimes there is nothing you can do but wait though. 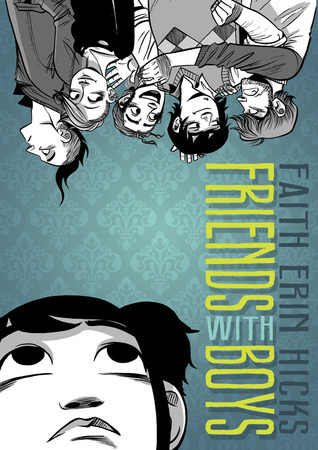 Another fun and fabulous book by Faith Erin Hicks. The only thing that sort of bothered me is the resolution with the ghost. I don't want to say too much about it, but I just was expecting more. I understand that it was symbolic, but I hate loose ends. This was an interesting look on how people change, by choice or by force. Some of the kids chose to be different than what they were expected to be and some, like Maggie, had to change because that's where life took her. I was never home-schooled, so I can't imagine the awkwardness of having to go to a public school. I totally imagine it would be overwhelming, all those people and all that scheduling and bustling. It's way different from a relaxed home-school atmosphere. This was a funky book and if you have read Hicks in the past check this out. Also if you like Scott Pilgrim, I would recommend this it has that fun weird feel to it. "Lucy kind of likes you and would really like to stop hiding behind that tree in shame."